Jeep Wrangler (JK) (2007-2015); Non-Export models; Front Turn Signal, Rear Turn Signal, Front Parking Light, Rear Parking Light, Brake Light, Reverse Light. Jeep Cherokee (XJ) (1997-2001); Front Turn Signal, Front Parking Light, Rear Turn Signal, Rear Parking Light, Brake Light, Reverse Light. Jeep Grand Cherokee (WK) (2011-2015); Rear Side Marker, Rear Turn Signal, Brake Light. Jeep Patriot (MK) (2010-2015); Rear Side Marker, Rear Turn Signal, Rear Parking Light, Brake Light. 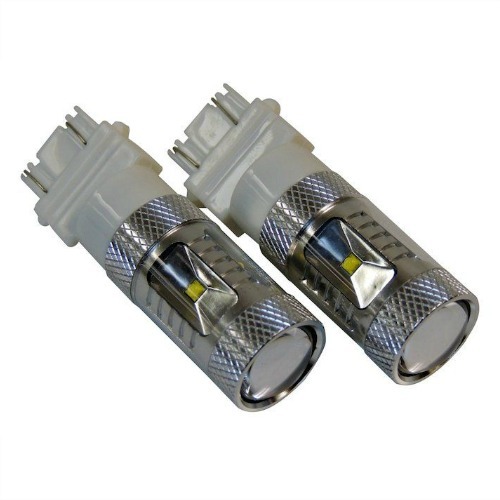 LED Plasma White Bulbs; 3157 White LED Bulb Kit; Includes 2 Lights. Installs In Place of OEM Bulbs. Each Lamp includes 6 Cree LED's That Produce 1200 Lumens; 360 Degree Light Output. Each Lamp Rated at 7.2 Watts / .6 Amps Draw at 12 Volts. 50,000 Hour LED Bulb Life; IP68 IP65 Rated for Shock Protection.